For a successful digital marketing campaigning, you need to implement a set of different strategies that can lead towards higher ranking towards the search engine. However, it requires a lot of patience and knowledge of up to date techniques because algorithms of search engine always keep on changing. While doing marketing activities, sometimes our operational activities are accidentally marked as spam. For instance, sending emails randomly to multiple addresses sometimes detected as spam by a server and your IP address is added into the blacklist. It can be listed in single or multiple blacklists depending on the malicious activities such as a virus, spam or malware. Sometimes, a PC infected by a virus or malware automatically start pinging to communicate with other systems. If these activities are noticed frequently, the IP address will be blocked. For digital marketers, it generally happens because of spamming. Sometimes, intentionally or unintentionally marketers keep on targeting potential customers in an ethical or unethical way. Such kinds of situations generally occur when unplanned digital marketing strategies crossed the limit of the search engine’s parameters. Some very common targets of spamming in digital marketing are search engines, discussion forums, and email inboxes. If any of these activities are detected, consider your IP address blacklisted in one or more lists. If you want to know the current status of your IP address, it is important to run a test with the help of blacklist checker tool. The Blacklist checker tool will show your URL is listed on DNSBL or SURBL system. DNSBL is mainly used for domain name blacklist sites, so the incoming emails should not be coming from Blacklist site to defend against spam. To know your domain is blacklisted or not, just enter your URL in the box and click submit button. Our server will check the DNSBL system if the site URL is listed in the system or not and gives back the information. Spamming is one of the biggest issue of the digital marketing world and still there is not an effective way to harness over it. Consequently, many marketers are taking its advantage to reach their customers in unethical ways. For instance, using a bot for sending emails in bulk is considered in spamming. For controlling such kind of activities, servers detect the behavior of a DNS and blacklist it. There are several anti-spam DNS based databases that can help you in checking whether the IP is blacklisted or not. It will not affect too much on the life of a normal computer user at home but professionals have to face several issues while sending emails or doing other activities to target the potential customers. If the IP is blacklisted, one cannot implement any digital marketing strategy effectively. There are around 70 lists of DNS based blacklists and your IP can be included in any of them or multiple depending on the spamming or malicious activities. There are dedicated online tools to identify this. You just need to enter the public IP of your system and leave the rest of the work on this tool. Many online portals are currently providing these services for free of the cost. In addition, you can also solve the email delivery problems with this small but powerful tool. There are many popular blacklist checker tools available online to know the status of IP is blacklisted or not. You can check your IP address in any of these options without requiring any signup or subscription procedures. Why do we need a Blacklist checker tool? The email service providers blacklist your IP when the recipients of emails mark them as spam. If your emails are detected as spams by multiple users, the email service provider company add the IP address in the blacklist. If this happens, you will not be able to send emails to the users of a particular email. If a DNS is blacklisted, you will not be able to utilize the full potential of available digital marketing sources. For instance, a large number of your emails will fail before they deliver. Also, you will not be able to reach the potential customer's through other marketing campaigning’s such as Google ads or backlinks. A blacklist checker too helps you in figuring out that which blacklist is preventing you to execute the strategies successfully. If adequate traffic is not coming to your website and the existing level is also declining, consider it as the result of a blacklist. If your IP is listed in more than one blacklist, the impacts will be more adverse. Therefore, it is essential to identify the main reason for the problem. This list includes the IP addresses reported for malicious behaviors such as using spam bots, open proxies and dictionary attacks. All of these are hacking activities and non-tolerable at all. As the name is illustrating, this blocklist includes the addresses reported for spamming through emails. Even if you are not spamming, some hackers might be using your IP to sent thousands of emails that bring you in the category of blacklisted. A server IP is landed in XBL exploits blocklist especially when it is hijacked by any third party. If the server is used as a spam gateway through your IP address, consider it blocked. It is a kind of easy on and off blacklist that relies on spam-traps. If the server emails their spam-trap, it will be blocked However, there is an easy request removal method for this issue. It is an IP based blacklist that monitors the addresses with the highest spamming percentage. If your IP is coming in this category, they will add it in the blacklist immediately. This list is specially designed to track down the snowshoe spammers who spread spams through emails in bulk. The blocklist of SenderScore works on the basis of the rating given to your IP by corporate email systems and marketing service providers. In the numeric figure, if your score drops below 85, the address will be considered in the block list. If you are listed in this category, all emails will be directly routed in the spam folder of the recipient which is totally worthless from the perspective of digital marketers. If your IP address is hijacked by hackers and being used for several malicious activities, it must be listed in a blacklist. The tool of blacklist checking can detect and inform you regarding the concern. You can take effective steps on time to get rid of this problem. The success of digital marketing campaigning completely depends on the reachability to the potential customers. If your attempts are failing to reach, it is important to detect the main reason. This tool can help you in identifying the problem is persisting due to the blacklist. How does the Blacklist checker tool work? The blacklist checker tool is basically an online portal where you need to fill the required information to obtain accurate information. Here is the process of its working. Open a website from the above-mentioned website URL that you want to check the domain is blacklisted or not. You will find a space where to enter the URL address. Open a new tab in the search engine and type “my IP address”. It will show your public Ip address in alphanumeric figures which may require in the future. Copy this URL address & paste in the column of online blacklist checker tool. Run the test and you will get a list of blacklists with their status. If there is an issue, it will be on the list with a valid reason. If your IP is added in a blacklist, the digital marketing campaigning will fail miserably. Even if you notice a little bit of fluctuation in the traffic, it is important to check the IP address for blocklists. Timely checking can prevent you from big losses of time and money. Every computer system connected with the internet is vulnerable to cyber threats like virus or malware. It is possible that someone has hijacked your IP address to send spam emails. The tools of blacklist checking can help in identifying such kind of issues instantly. 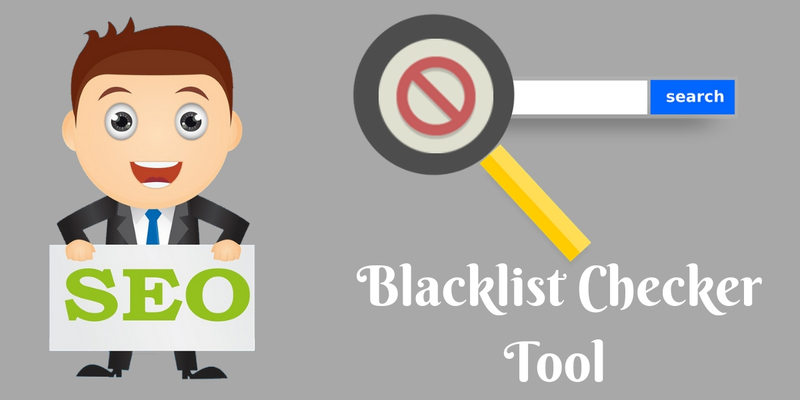 A tool of checking blacklist is very helpful if you know how to operate. It is advisable for everyone to run the test at least once in a month to be sure about the safety of your IP and success of marketing campaigning.